It is important to spend time with our vendors to collectively develop new business opportunities that provide a win-win for all involved parties. From Mood’s perspective, it’s important to continue to foster our relationships with best-in-class hardware providers, as Mood does not manufacture the equipment we install. We rely on great partners such as Elo to provide reliable hardware that can withstand the demand our customers require. Elo has been an official partner of Mood for many years and we continue to grow in the digital signage space together. 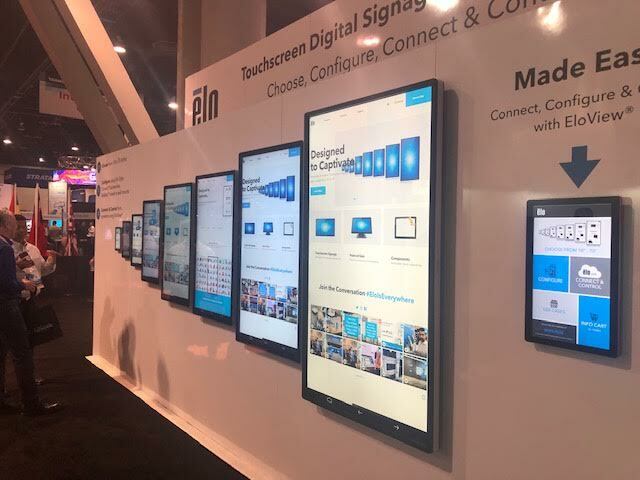 At the 2019 Digital Signage Expo, we were able to spend quality time with our friends at Elo, discussing new client opportunities and digital signage solution rollouts, while being great thought leaders together. When providing unique screen sizes and options to clients, it is more important than ever to determine the purpose and placement of the screen. The purpose should focus on what value the screen is providing to the end consumer. What content is being displayed? What offer or call to action is shown? Why are screens even being deployed? Answering these basic questions will help better understand the purpose of deploying digital signage. The placement should focus on where the screens will be located. Are they located at the point of sale, window facing, or in the waiting room? There are distinctly different content strategies to each screen and having a clear understanding of where screens are located will help determine the placement. Elo brings great solutions to the table and different screen sizes for every application. From small form factor screens for conference room A/V to larger way-finding displays in high-traffic areas, it’s been great to grow the business with Elo while mutually looking forward to the future together.